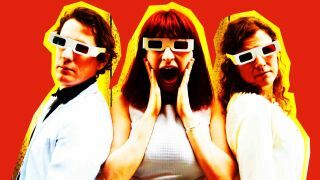 London-based riot grrrl trio Bugeye are premiering the video for their new single, Wake Up, exclusively with TeamRock. The track, which takes aim at the gentrification of London’s music scene, is a powerful slice of disco-punk – described by the band as “Blondie vs The Pixies” – with an eye-opening video to match. Check out the video, and learn more about the song, below. What’s the story behind Wake Up? Can you talk us through the concept behind the video? What do you hope people will take from the song and its video? Why was it important for you to get involved with the Loud Women and Music Trust campaigns? “The Music Venue Trust charity came to our attention a couple of years ago at a gig a mate’s band was playing at. We’ve since been strong supporters, donating, attending shows and sharing news when and where we can to help with awareness. Their work is so important in protecting and securing the future of our iconic grassroots music venues in the UK. These are the places that have been key to the development of British music over many years. They’ve been the starting point for many bands and have always offered fans an affordable option for discovering live music. We’ve lost way too many of these places already, so it’s so important that people get behind the Music Venue Trusts #fightback17 campaign so we and future generations can continue to enjoy these awesome spaces. What can we all do to support our local music communities better? What do you guys have lined up for next?